Panasonic's TZ series of compact cameras has always been popular with enthusiasts, because they offer plenty of flexibility both in terms of manual controls and a large zoom range. The Panasonic TZ35, known as the Panasonic ZS25 in the US, follows on from last year's Panasonic TZ25, but sees an increase in zoom ratio with a 20x optical offering. That gives it a very versatile range of 24-480mm in 35mm terms. A 16.1 million pixel sensor can be found onboard that, according to Panasonic, combines with the Venus Engine for a high performance result. We've been impressed by the performance of TZ cameras before, so we're looking forward to putting this one through its paces. Unlike the Panasonic TZ40, which sits at the top of the line, the TZ35 doesn't have added extras such as Wi-Fi or near field communication (NFC), but if you can live without those kind of options, then this "budget" version is a good idea. Although it boasts the same zoom range as the Panasonic TZ40, the TZ35's pixel count is slightly lower, with the more expensive camera featuring an 18 million pixel sensor. Like its predecessor, the Panasonic TZ35 features a MOS sensor, while previous iterations used a CCD. Another exciting feature of the Panasonic TZ35, which perhaps appeals to the all-round photographer, is its ability to shoot at up to 10fps in high speed burst mode, giving it fantastic potential for action, or fast-moving subjects. You can also shoot at up to 5fps with continuous autofocus. Light Speed AF is also available, facilitated by the Venus Engine. As with the previous camera, a number of creative filters can be deployed, but the ability to use them when shooting a Panoramic image is new. A total number of 14 filter effects can be found on the camera, presumably in a bid to compete with the likes of Instagram et al. Full HD video recording is available at 50i, along with 25p in MP4 format. Power OIS (optical image stabiliser) is available in both stills and video recording, and is designed to help reduce blur caused by camerashake. As well as Intelligent automatic modes, full manual control and semi-automatic control (aperture and shutter priority) is available. Unfortunately, the camera can't shoot in raw format. Unlike the Panasonic TZ40, the 3-inch, 460k dot screen isn't touch-sensitive. 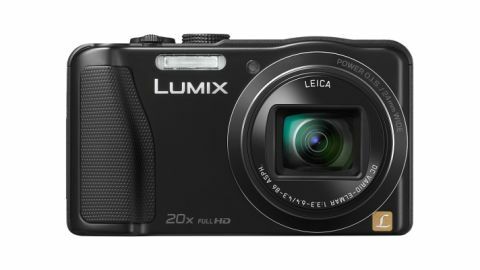 Many of the specifications of the Panasonic TZ35 are very similar to the Panasonic TZ40, but it is available for less money than its sibling, priced at £299.99 in the UK (around AU$449) and US$299 in the US, where it's called the Panasonic ZS25. Let's see how it performs.